Sunny skies, tall shady trees, the sound of waves crashing upon the beach, and vibrant sunrises peaking over rugged mountain tops – as if you really need an excuse to get out and enjoy nature. Yet nature isn’t just for taking in astounding sights or adventuring through the outdoors; spending time outside does wonders for people’s physical and mental health, making it an ample way to improve your well-being. 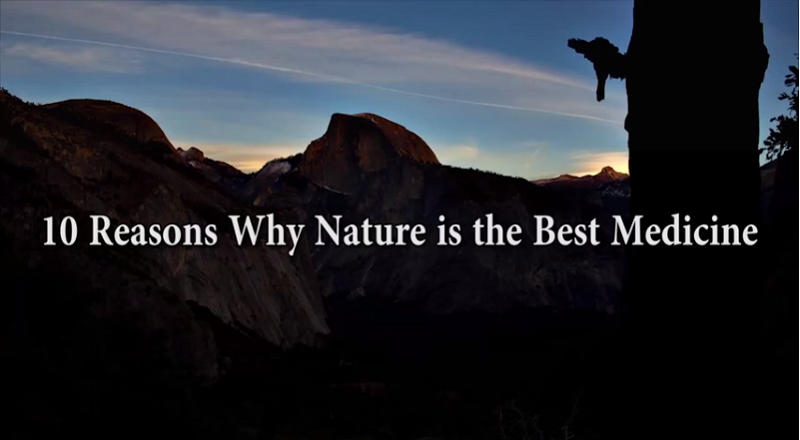 However, if you aren’t already convinced to get your daily dose of outdoor beauty, here are 10 reasons why nature really is the best medicine. Recent studies have shown that the closer you live to nature or green spaces in general (simple parks included), the happier you’ll be. Being able to easily access the great outdoors gives you more opportunities to reap all the benefits that nature has to offer, especially more so than those who live in urban areas, who also happen to have worse mental and physical health than their more rural counterparts. Just strolling around outside doesn’t really require any elaborate thinking or action or your part, which is great for your mind. When you take a walk in nature, electrochemical changes occur in your brain, producing calming and beneficial results. Furthermore, the brain activity when entering a natural spot is indicative of a relaxed, meditate state. However, when leaving the spot, this activity is actually reversed, making being outside on a regular basis essential to good health. Vitamin D is crucial to humans, helping to prevent disease and infection and improving bone health. Yet many people are lacking this essential vitamin, and there’s a simple way to get it – spending time out in the sun. Sunrays provide plenty of vitamin D, so being outdoors during day can greatly improve your health. While it may sound counterproductive, being out in the sun also helps you sleep. Sunlight, especially in the morning, helps regulate your internal biological clock, making it much easier for you to get your needed rest when bed time rolls around. Researchers are finding that being out in nature greatly reduces people’s stress levels. Simply taking in outdoor sights and sounds is relaxing to the body and mind, helping to decrease worry and anxiety. You don’t have to be a nature lover either, or even enjoy being outdoors – it’ll still have stress reducing benefits, regardless of the time spent or type of activity you engage in. Nature has been shown to directly improve people’s physical health, including patients who are recovering from a disease or illness, surgery, or any other type of ailment. Patients who are exposed to the outdoors tend to recover more quickly, use less pain medication, and have shorter hospital stays. And they don’t even have to physically be out in nature either; these remarkable results have also occurred from patients having a window with an outdoor view or paintings of nature in their room. Nature can also help curb mental dieses as well, like depression, ADHD, and other psychiatric problems and illnesses. The relaxing and calming properties of nature greatly contribute to these results, and ADHD patients have also been shown to have longer attention spans when outdoors than inside. Being out in nature often involves some form of physical activity, whether it be strolling through the park, biking through the mountains, or an exciting river raft ride. This activity both improves physical fitness and can help decrease the likelihood of obesity. Spending time outdoors doesn’t only work the physical aspects of your body but can also strengthen your senses and memory. When in nature, you’re exposed to plenty of sights, smells, sounds, and touches and have ample amounts of new things to take in. These experiences help enhance all your senses, and being outdoors (even for short periods of time) has also been proven to improve short term memory. Let’s face it, being in nature just makes people happier in general. The great outdoors changes brain chemistry in a positive way, improves mood, decreases stress, provides opportunities for fun, and is simply downright beautiful. Sometimes Nature Is Awesome. Other Times, It’ll Scare The Life Out Of You. Like This. Every Time I Think Nature Can’t Shock Me Any More, I Discover Something Like This. Wow. This is Simply Spectacular: Nature At Its Best. I Could Watch This Over and Over and Over Again.